In 1 1/2-quart saucepan, cook barbecue sauce with shredded pork and 2/3 cup of the pineapple tidbits over medium-high heat for 6 to 8 minutes, stirring occasionally, until thoroughly heated. In 10-inch skillet, cook each tortilla over medium-high heat for 20 to 30 seconds, turning once, until thoroughly heated. 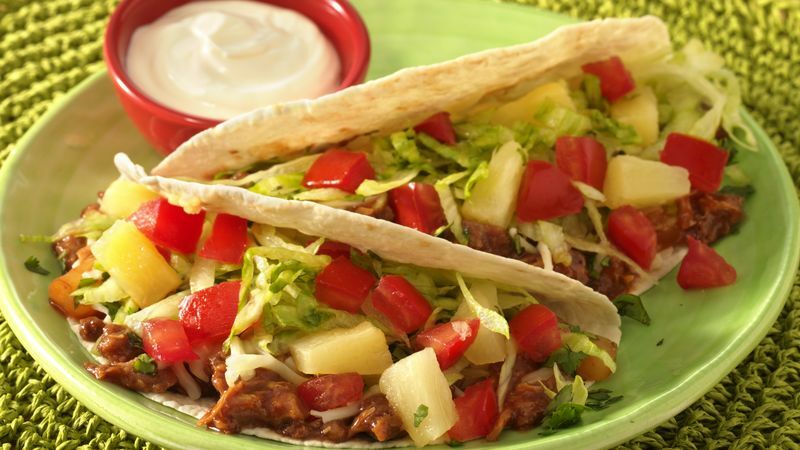 Onto each warm tortilla, spoon about 3 tablespoons pork mixture, 1/4 cup cheese, 1 teaspoon cilantro, 1/4 cup lettuce, heaping tablespoon tomato and scant tablespoon remaining pineapple tidbits. Top each with sour cream.